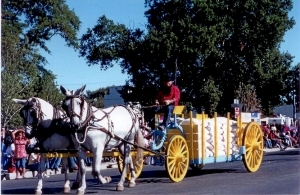 PENDLETON, Oregon – The Pendleton City Council is deadlocked, by a 4-4 vote, on whether to require parade permits and let the chief of police set a permit fee depending on the event’s cost to the city. Mayor John Turner thought he could cast the tie-breaking vote on the resolution and the ordinance involved. It turns out, that’s not the case. “The mayor breaks a tie vote on everything except the adoption of ordinances and resolutions,” City Manager Robb Corbett said after he and City Attorney Nancy Kerns checked the rules. The debate on the issue centered around the proposal’s exemption of the Little League, Fourth of July, Dress-Up and Westward Ho! parades from requiring a permit and paying a fee. “There are a number of city council members that think that either (a) we ought to not charge anyone anything or (b) if we’re going to charge other citizens for non-traditional parades, then we ought to charge those four traditional parades,” Turner said. As instructed by the rules regarding tie votes, the issue will be put on the agenda for another try at the next regular city council meeting. That will be on April 2 at 7 p.m.